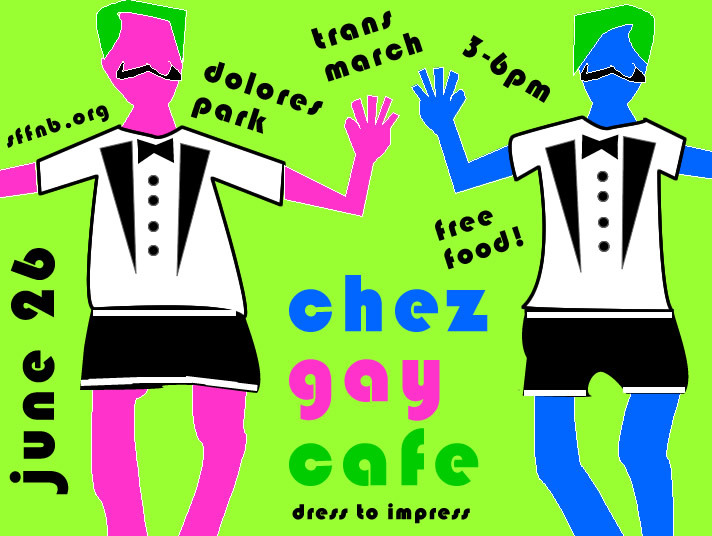 Join SF FNB for the second annual Chez Gay Cafe (food support) at Transmarch! We hope to make our event bigger & gayer than ever. We need lots of help to make it happen, if you’d like to contribute, (1) just show up or (2) email us at sffnbvolunteers@riseup.net to help with with prep and gathering food. This year we will have some turkey fryers and other equipment that will require a little more coordination, but it should make our serving even cooler! Rumor has it our crew will be sporting tuxedo tshirts, short shorts and skirts, possibly fake french mustaches. We encourage everyone volunteering to dress to impress! We hope to see many of our fellow queer FNBers at the cafe, though all respectful folks will be welcomed, queers and allies alike; this event is probably one of the most fun of the year, so please come out!